JetBlue Airways has decided to install 162 seats rather than the originally planned 165 seats in retrofitting each of its Airbus A320 jets with new passenger-cabin interiors. Each JetBlue A320 (all of which are in its “All-Core” fleet) currently has 150 seats, so JetBlue’s A320 cabin refurbishment will see it add 12 more seats in each aircraft, rather than the 15 originally planned when JetBlue revealed the forthcoming change to financial analysts in late 2014. 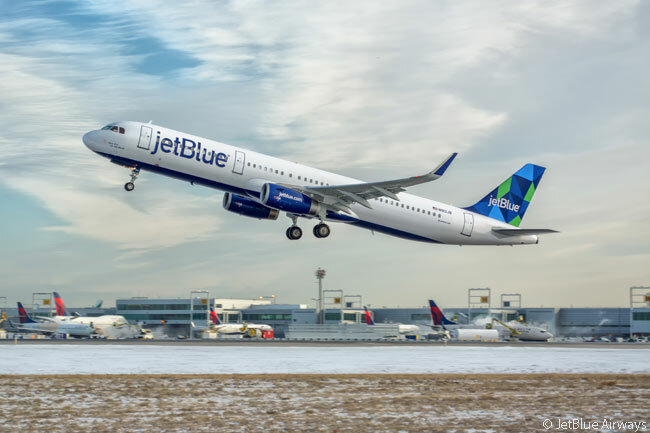 First, however, JetBlue will install 10 additional seats in each of 15 A321s in its All-Core fleet, increasing the seat count in each of these aircraft to 200. The airline says it will not change the 159-seat cabin configuration in the A321s it uses to operate its ‘Mint’ premium-cabin service. The carrier flies these aircraft on major U.S. transcontinental routes and on an increasing number of prime routes between the U.S. mainland and destinations in the Caribbean and Latin America. 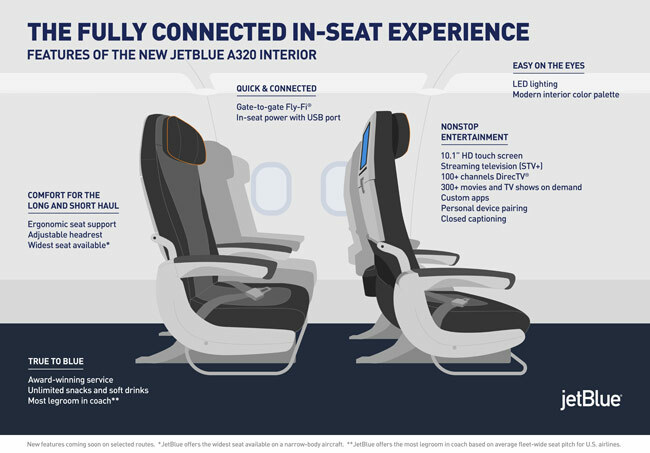 JetBlue decided to reduce the number of additional seats it is installing in each A320 “after a comprehensive review of layout options and feedback from frontline crewmembers who have been integral to the redesign process”, according to the airline. As part of the retrofit, JetBlue will introduce Airbus’ new Space-Flex v2 galley-and-lavatory module on its A320 and A321 All-Core aircraft, freeing up additional space in which some of the extra seats can be installed. The installation makes an overall reconfiguration of each aircraft’s cabin necessary, according to the carrier. As part of the reconfiguration, although JetBlue contains to claim it offers “the most legroom in coach” of any major U.S. carrier, the seat pitch of each A320 standard economy seat will decline to 33 inches from the 34 inches all of JetBlue’s A320s currently offer. JetBlue already offers 33-inch pitch as standard in each of the 15 A321s in its ‘All-Core’ fleet. Following the cabin reconfiguration, the seat pitches offered by ‘Even More Space’ extra-legroom seats in JetBlue’s A320s and A321s will continue to be from the 37 inches to 41 inches these seats offer now, the seat pitch varying depending on the seat’s location. JetBlue and Airbus will reconfigure the 15 All-Core A321s with the new Space-Flex v2 modules and seating configuration in the second half of 2016. The airline plans to begin its A320 restyling in early 2017 and it is targeting completion in 2019 of the cabin reconfigurations in all of its 130 existing A320s. JetBlue’s reconfigurations of the 130 A320s will see each aircraft fitted with B/E Aerospace Pinnacle seats as standard. The airline claims these seats offer better comfort to passengers because they have a patented comfort suspension system. Each Pinnacle seat is also fitted with moveable headrests that slide up and down and wrap around the neck for additional support. 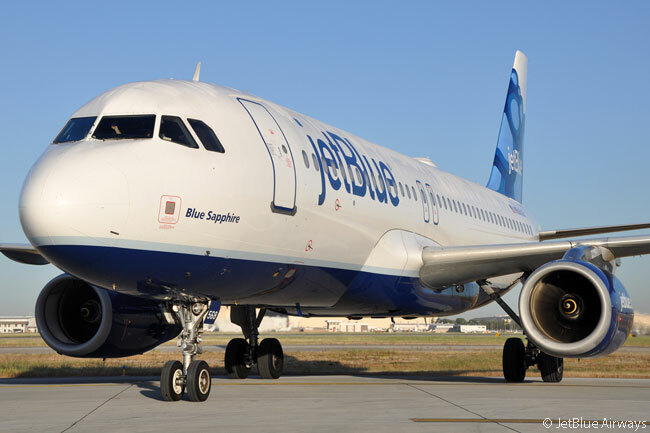 All of the new A321s, A320neos and A321neos which JetBlue has on order and which remain to be delivered – a total of 90 aircraft – will be fitted with the new cabin configurations, except any A321s JetBlue decides to configure for operation on its growing premium-service ‘Mint’ network. JetBlue Airways will not reconfigure the cabins of the 60 Embraer 190s it has in service. The carrier hasn’t said if it will adopt a new cabin configuration for the 23 Embraer 190s it still has on order, which various sources believe the carrier either won’t take or else will decide to re-specify as second-generation Embraer 190 E2s. 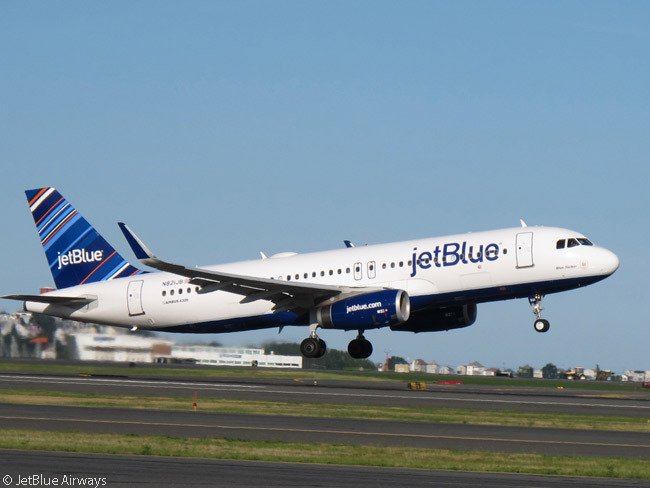 As a possible compensation to any JetBlue customers dismayed by the carrier’s decision to reduce the economy seat pitch in each of its A320s, JetBlue has announced its A320 and A320 cabin reconfigurations will offer passengers various new and upgraded facilities. These will include including free gate-to-gate Fly-Fi high-speed Internet; a new Internet-enabled in-flight entertainment (IFE) system; 10-inch high-definition, touch-screen seatback screens (instead of the five-inch screens JetBlue’s A320s have installed now); and in-seat power outlets with USB ports at every seat. 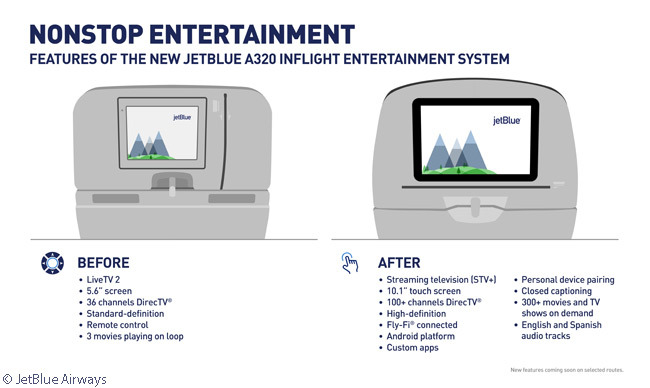 JetBlue claims it will become the first U.S. domestic airline to launch an IFE system that connects each seatback television screen to the aircraft’s Wi-Fi Internet connection for customer use. The new streaming-television IFE system from Thales – STV+ – is built on the Google Android platform. According to JetBlue, the choice of the Android operating system opens “unlimited possibilities for custom app and widget development, live content streaming, audio-and-video-on-demand, and personal device pairing to offer more entertainment options than ever in collaboration with JetBlue’s … content partners”. In addition to streaming content, JetBlue will expand the number of DirecTV television channels it offers, from 36 today to more than 100. The new IFE system will also have the capability to offer a library of more than 300 on-demand Hollywood films and other content stored locally on the aircraft. JetBlue will also enable gate-to-gate access to Fly-Fi, the airline’s free wireless Internet service powered by Thales and ViaSat. Fly-Fi offers download and upload speeds from 12 to 20 Mbps to each connected device, according to the carrier. 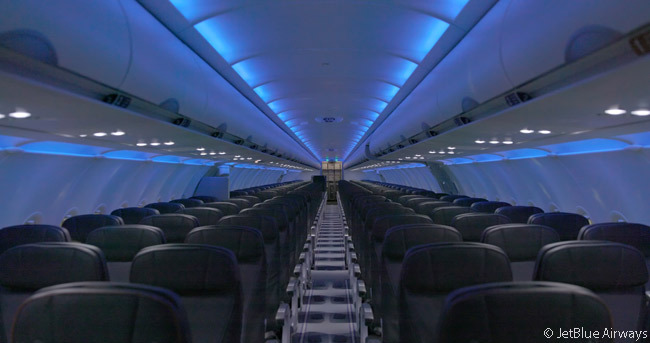 The reconfiguration of the cabins in each A320 and A320 in JetBlue’s All-Core fleet will also include installation of color-changing LED cabin lighting and an interior color palette that the airline claims will make the cabin experience more stylish and more comfortable for passengers.